I love the Christmas season. There has always been great excitement in our house in the lead up to Christmas. I love making it special for the kids. I find it a fantastic time of the year to explore the Christian faith more. I also find it an easy time of year to share my faith with others. I also love having traditions at Christmas that the kids look forward to each year. I believe traditions are the glue that help kids feel connected to the family when they are older. This year, we are going to Tasmania for Christmas with my extended family – dad, brothers, sisters and their families. This will be the first Christmas we have been back to Tassie for ten years. Matey has never had a Christmas there. Mum was the social glue in our family and once she died, it just wasn’t the same. This year, we are trying again. Thus, we will be flying there mid December as we need to return 2 days after Christmas so as to go away on beach mission the next day. Already there has been much discussion in our household about how we are going to manage Christmas. The kids have decided how we will do presents this year as it will be different. They have also voiced their opinion that we won’t put up a Christmas tree this year as it will save us a day in both putting it up and another day packing it away. I love that tradition and the tree with all the lights so we will see what happens!! We recently heard Joshua Mills mention that his family puts their Christmas tree up at Halloween and leaves it up until after Christmas as it is a major event in the Christian calendar and a great witnessing point. Hubby loves this idea so the latest idea about Christmas is that we may put the tree up November 1st. We have decided we will still have the nativity sets though. I have seven different sets which we position around the house (I am still saving up to buy the ‘Willow Tree’ nativity set). The kids used to love playing with all the people and the animals when they were younger. I love having a nativity scene in every room so that no matter where you are, you are reminded of the event of Jesus coming to earth as a human and all that means. Christmas Drama: A tradition that we have is going to the ‘Road to Bethlehem’ drama production put on by the Seventh Day Adventist Church in Melbourne. It is a huge event where you walk around the property and are caught up in the drama of that event over 2000 years ago. It is extremely impacting and the kids absolutely love it, especially Matey. For those people living in Melbourne, you need to book tickets (they are free but must be booked) but they ‘sell’ out extremely quick so please email/ring on Monday 24th November at 9am in the morning. It is being held in the evenings in Nunawading, Melbourne from the 8th -11th December. From the website, it looks like the production is also put on in Erina on the Northern Coast of NSW, Brisbane, Livingston in Western Australia and in both the North and South Island of New Zealand at Tauranga and Christchurch. Apart from the church concert and the Carols by Candlelight service, the kids love being involved in the local nativity play. All of this helps them to get a rounded view of the Christmas story. This year we have the added delight(?) of both children being involved in the church production doing dance. (I query delight as practice is every Sunday and Wednesday between now & mid December and we live 45 minutes away but we have decided that for one year we are willing to sacrifice the time involved. Books: I have a heap of Christmas books I pull out every year and place in a special basket. I also go through the kids bookcases and pull out all the children’s Bibles and we read the birth of Jesus in all the different versions. We try and read one, or part of, every day. My all time favourite book is “The Best Christmas Pageant Ever” by Barbara Robinson. (www.bookdepository.com/?a_aid=raisingworld) Funny, memorable and outrageous, it is the story of a family of incorrigible children who discover the Christmas story for the first time and help everyone else rediscover its true meaning.) This is a must read in my opinion. Suit ages 5-adult. It sheds a whole new light on how you view the Christmas story. If you were to spend any money on a book this Christmas, then please buy this one. Your children and you will laugh and laugh as you read it. We ended up buying the whole set about the infamous ‘Herdmann’ family as they are so funny and unbelievable. Another book worth considering for those children a bit older is “Jotham’s Journey” by Arnold Ytreeide (Ten year old Jotham’s adventure takes him across Israel as he searches for his family whom he got separated from on the journey to the census centre. Though he faces thieves, robbers and kidnappers, Jotham also encounters friendly wise men, shepherds and inn keepers until at last he finds his way to his family and to the Saviour born in Bethlehem.) “Tabitha’s Travels” and “Bartholomew’s Passage” are linked as they are about 2 separate children who befriend Jotham along the way. They are more suitable for kids over 8 years old. Advent calendar: Every year we have an advent calendar. When the children were younger, I used to make up one with balloons and stickers and non food items. I would write out the Christmas story on to blank stickers. I would then place these in envelopes so that every day we read out the Christmas story and we would stick it to the front of the envelopes. We then read up to that point in the Christmas story every day. By the time Christmas morning came around, we knew the Christmas story so well. There are so many ideas if you google ‘advent calendars’. As the children have become older, the Lego calendar and chocolate calendars have become popular. Devotional: I have really enjoyed using the ‘Truth in the Tinsel’ (www.truthinthetinsel.com) and the Jesse tree devotional activities in the heart preparation to Christmas Day. If you have a Lego fan, www.EducatingLaytons.com has a Lego daily component that fits in with the ‘Truth in the Tinsel’ devotional. Basically, there is a reading from the Bible and a craft to make every day. The kids really enjoyed it when they were younger. Gifts for others: Every year we love going to Target and getting a gift tag off the tree for a certain aged child and then buying presents for that child and placing under the tree. This has evolved over the years so that the kids can now think about what that person would love and keep the focus off themselves. We also take part in buying grocery items for families struggling financially. One year we had the beautiful opportunity to deliver a hamper to a family. We were so ‘blessed’. This family were so amazing in their response and it was an amazing time for my kids to witness. Reminders of the true meaning of Christmas: Apart from having so many nativity sets throughout the house, we also do some other decorating. Every year, the kids brainstorm and write the names of Jesus on glass baubles and we place them in a huge glass vase. Some years, we write on a bauble per day, other years we spend an hour just filling the vase up completely at once. This becomes the table centrepiece. Tree decorations: The kids get to choose a new Christmas decoration every year. My plan is that the first year they are married or living away from home, I will package up their Christmas decorations that have so many memories for them and give it to them to place on their own tree. Every year I also get a photo of each child and make a Christmas decoration with the photo on it and we all love looking at the change in the kids every year. This brings back a lot of great memories. There is another site http://blog.jamesandjuliepaquette.com/family-nights/shepherds-pouch/ where the mum rewards the kids with coins whenever she sees them doing an act of service in the lead up to Christmas. She places the money in a shepherds pouch and on Christmas morning they empty the pouches, count the money and then look through the gift catalogues for TEAR, Gospel for Asia’s poor, World Vision etc and decide how they will spend the money and send it overseas. Another fantastic idea is to have a big jar or container and every day each family member writes down one thing they are thankful for and places that piece of paper in the container. On Christmas Eve, the family sit down together and open the container and read out the things people have been thankful for. I love activities like this as it takes the focus off presents and receiving stuff ourselves. Birthday cake: When the children were very young, we began the tradition of making a birthday cake for Jesus on Christmas day to celebrate His birthday and keep the focus on Jesus. We love going to church Christmas morning as well, giving Him that time before the rush and noise of Christmas lunch. Cooking: My children love cooking and we spend time each year cooking up biscuits and cakes as presents for neighbours and extended family. Last year, Matey also made shortbread biscuits in the shape of the nativity pieces and decorated each piece with icing and sprinkles. He loved this. The cutters are easily found in specialist cooking shops. Christmas street party: Every year we love to celebrate Christmas with friends and family but also neighbours. We love serving our neighbours by putting on a street Christmas party for the 60+ houses in our court. We have ball games for the kids and the adults sit and stand around chatting for ages. Photo calendar for the next year: A tradition I commenced when the kids were younger was to give hubby a photo calendar I had made for the next year. The photos are of the kids taken throughout the year at memorable times. On Christmas morning, we all love looking through the calendar at the photos. A copy is also given to the grandparents. 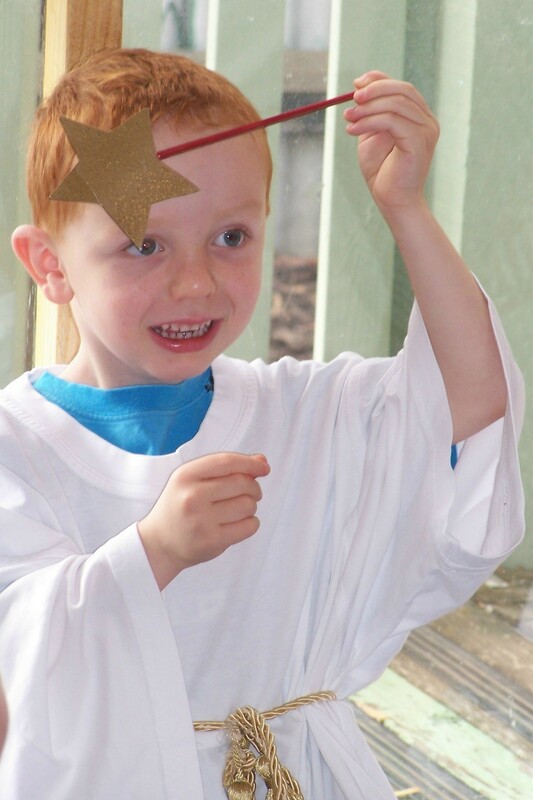 Younger children: a Christmas sensory box worked well with red green and gold craft items, stamps, stickers and nativity pieces where the children could play and create to their heart’s content. Christmas lights: Every Christmas we take a drive around the local area and spot houses decked out in lights. We enjoy spotting lit up houses on the evenings we are returning home from being out after dark. It creates a special atmosphere. Christmas Eve: Every year we have had close friends have a BBQ on Christmas Eve for their friends. This was a highlight in hubby and my Christmas, apart from the year Matey was born on the 23rd December and Princess vomited everywhere that evening. Those friends have since shifted interstate but new friends have that tradition as well so last year our whole family thoroughly enjoyed the Christmas Eve even more than Christmas Day. Back home in Tasmania, the tradition Christmas Eve is the street parade in the local town of Wynyard which has a population of 4,000 people but which I estimate probably 8,000 people turn out for this. Farmers deck out their trucks and tractors, churches have trucks with people dressed up as the nativity play, local groups all take part. My children have never witnessed this so we are looking forward to sharing it with them. Before I married 25 years ago and shifted to the mainland, I used to also love going to the church in the closest city, Burnie, at 11pm and having a candlelight service which finished at midnight when we turned on the lights and had fuitcake and drink. Even though it is a late night, I think that may be part of our Christmas this year. Christmas Day: One year, our family sacrified our traditional lunch with the extended family and helped run a Christmas Day luncheon for folk in our local town of Frankston who have no where to go on Christmas Day. We had a fantastic but extremely tiring day helping out. Matey and I absolutely loved it and want to do it again but this year is out as we are in Tasmania. I encourage you to spend a bit of time before the Christmas season to think about ways that you can creatively explore and enjoy the true meaning of Christmas with your children. I would love to hear from you what traditions you have that makes this time special for your family.